A study published today in the journal Nature Climate Change warns that climate change will cause a dramatic increase in El Nino weather events during the 21st century. Formerly happening once every 20 years or so, we can now expect an El Nino once every 10 years. An El Nino occurs naturally when the temperature of the Pacific Ocean rises, altering rainfall patterns and causing everything from extreme floods to severe droughts around the world. As The Guardian points out, the last severe El Nino (1997-98) caused between $35-45 billion in damage and killed about 23,000 people. The really scary part is that scientists used to believe that these naturally occurring El Nino events wouldn't be affected (which is to say, made more frequent or more severe) by climate change. This new study suggests that we may not be so lucky. "This is a highly unexpected consequence of global warming," Professor Mat Collins of the University of Exeter said in a statement. "Previously we had thought that El Nino would be unaffected by climate change. Tropical rainfall conditions such as those experienced in extreme El Ninos have a dramatic influence on the world […] the impact therefore on mankind is substantial." Climate experts say that more research is needed on the subject, but that things don't look good. You rarely want to hear the word "irreversible" bandied about when you're talking about the future of our planet. 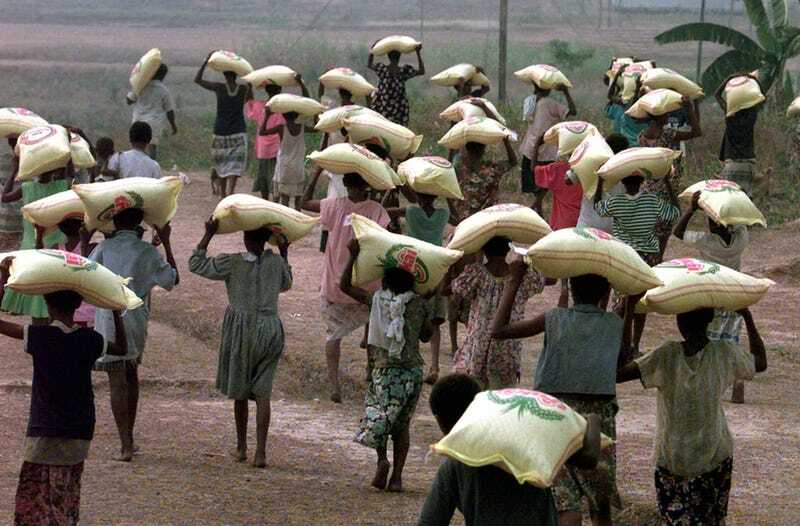 Photo: People in Papua New Guinea carry food delivered from Australia on November 2, 1997 after a severe drought attributed to El Nino gripped the country.